A hospice has been banned from accepting patients after it was rated inadequate due to concerns over safety. 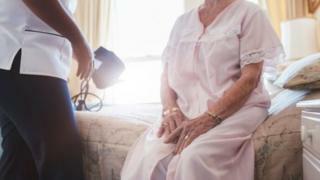 St Joseph's Hospice in Merseyside was placed in special measures after inspectors discovered issues including some ineffective monitoring of pain. The Care Quality Commission also found the way some medicines were given put patients at risk and recorded examples of dignity not being respected. George Foster, from the hospice, said it has been "improving" its processes. St Joseph's Hospice has had conditions placed on its registration including "preventing further admissions until it can demonstrate significant improvement". The 29-bed unit in Ince Road, Sefton, was accommodating 25 people at the time of the inspection in July - last year had been rated as requiring improvement. Staff did not always follow the principles of the Mental Capacity Act 2005 when people were unable to give consent, the health watchdog said. It said people had reported positive experiences and it was a "highly-valued service". Debbie Westhead, deputy chief inspector for Adult Social Care at the Care Quality Commission, said: "We found that St Joseph's Hospice, although providing a highly-valued service, was falling short of the standards that are required. "A period in special measures will allow the hospice to seek the support it needs to address our concerns and protect the people in their care." Mr Foster, chairman of trustees at St Joseph's Hospice, said the timing of the inspection was "disappointing". "We were in the middle of a major clinical change management process and only a matter of weeks after the appointment of our new clinical manager. "In the past year, we have revised and improved our clinical governance structure and processes, implemented a new staff training system and have been working... to address other long-standing issues." The hospice will be kept under review and inspected again within six months.